13 September 2012 - Columbus, IN - On a pleasant late summer day, the PPA National Tour contested the seventh edition of the Tournament Players Championship on courses # 1 and 2 at the picturesque Columbus, IN Putt-Putt Fun Center. PPA Hall of Fame Greg Ward member rode the momentum from his dominating five-stroke victory in the previous day's PPA ProPutters.com Classic to open the 72-hole event with rounds of 21, 25, and 21 and establish a three-stroke lead over the field of 51 professionals with one round remaining. Columbus local standout Jeff Garrison gave spirited chase by firing a closing-round 24, but when the dust settled, Ward's final-round 28 allowed him to escape with a one-stroke victory over Garrison with a 72-hole total of 95. The win gave the 51-year-old construction material sales Vice President from Loganville, GA his second-career Tournament Players Championship title. "My confidence was at a really high level after winning the ProPutters.com Classic yesterday," noted Ward following his triumph. "I played great right out of the gate by acing the first eleven holes on course # 1 and it really set the tone for the day. Shooting two 21's on course # 1 was special. I don't think that I could have played much better." Play commenced with Ward firing 21 on course # 1 to surge into a tie with Garrison at the top of the opening-round leaderboard, one shot ahead of 2007 PPA National Champion Rick Baird. Ward took solo possession of the lead after 36 holes at 46 with a solid second-round 25 on the more challenging course # 2, one shot clear of Garrison and Columbus local star Nate Nichols. With another 21 on course # 1 in the event's penultimate round, Ward established the 54-hole lead at 67, three strokes ahead of 2009 PPA National Champion Tony Varnadore and four shots in front of 2006 PPA National Champion Brad Lebo. Ward's torrid pace cooled off a bit on the fickle course # 2 layout in the final round, as he mustered only a pedestrian 28. Despite a valiant closing-round charge by Garrision, who posted a fourth-round 24, Ward held on to earn a hard-fought one-stroke wire-to-wire victory with a 72-hole score of 95. Garrison settled for runner-up honors at 96. 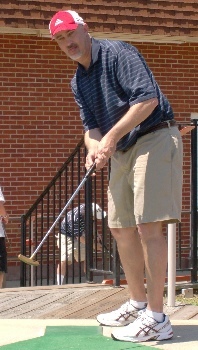 At 97, Varnadore, Lebo, and former PPA television contestant Jeff McDonald shared third position. Low round honors went to 1968 PPA National Champion Bob Marcellino, who carded a third-round 20 on course # 1. The cash line for the 35 money spots awarded in the event fell at a 72-hole score of 107. 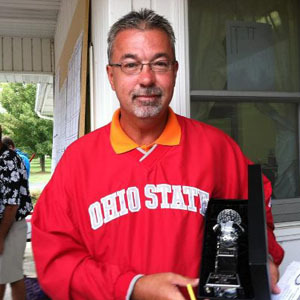 In the amateur division, Jeff Studer, a 45-year-old district manager from Mansfield, OH, was rewarded for his solid and consistent play throughout the event with a come-from-behind one-stroke victory. After opening the tournament with rounds of 24, 24, and 24, Studer stood in fourth place at 72, two shots behind 54-hole leader Matt Male and one stroke behind the daunting duo of defending champion Dr. Chris Chafin and 2010 APA National Champion Joey Graybeal. But by firing his fourth-consecutive 24 in the closing round, Studer pole-vaulted to the top of the final amateur leaderboard with an impressive 72-hole total of 96. "I never dreamed I would win a National Tour event," Studer humbly observed following the win. "It was one of the proudest days of my life. My playing partners Adam Sahmel and Mickey DeLucca made it one of the best tournaments in which I have ever played." Chafin posted a final-round 26 to finish second at 97. At 98, Graybeal completed the event in third position. Graybeal also garnered amateur division low round honors by virtue of a second-round 20 on course # 1. Despite a fourth-round 29, Male held on to finish fourth at 99. A gaggle of players tying for fifth place at 104 included 2011 PPA ProPutters.com Classic APA Champion Danny Tatum, reigning Eastern Open APA Champion Donnie Carpenter, two-time Great Lakes Tour APA Champion John Kropinak, and current Western Open APA Champion Geoffrey Mosk. The 2012 PPA National Championship week will continue with the contesting of the PPA National Championship and APA National Championship tournaments on courses # 1 and 2 at the Columbus, IN Putt-Putt Fun Center. The two-day, 144-hole events will tee off at 10:00 a.m. on Friday, September 14 and 9:00 a.m. on Saturday, September 15.